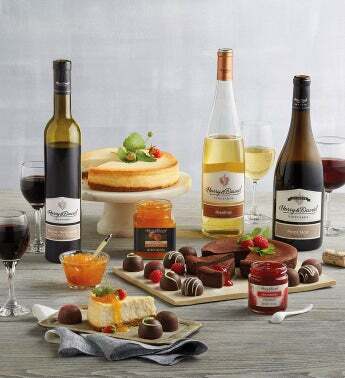 We've packed three elegant gourmet wine and dessert pairings, along with a helpful pairing card, into one of our signature gift boxes. This gift set comes with both chocolate decadence cake and New York-style cheesecake, handmade in our Harry & David™ bakery. Delicious strawberry preserves come ready to be paired with the chocolate, while the cheesecake is topped with apricot peach preserves. Tying everything together are two carefully selected wines. Our Beeson Tempranillo dessert wine complements the rich chocolate flavors, while a Reisling is tailored to the cheesecake's lighter notes. Lastly, our Harry & David™ Reserve Pinot Noir goes great with signature chocolate truffles. This trio of delicious pairings makes a sweet delivery.